The backwater destination of Kumarakom has surely inspired many authors with its bewitching labyrinth of canals, allowing tourists to sail on the boon of Kerala. Located just 16 km west of Kottayam, this is an unhurried town where the luxury of snaking on the eco-friendly houseboats can be availed during Kumarakom City Tour. Spread on scattered cluster of islands on Lake Vembanad, this location is another idyllic resort of birds, apart from humans. All the natural elements in Kumarakom come together to make this destination an absolute dream; a soothing trance for the mind, body and soul. 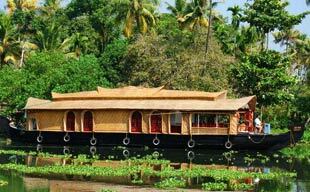 Kumarakom Backwaters – The backwaters of Kumarakom are the magnet which attracts hordes of tourists every year. The enticing charm of this flourishing eco-system made this place one of the must visited spots in the world. The backwater hub is based on a cluster of islands on eastern banks of Lake Vembanad. Kumarakom Bird Sanctuary – Another prominent attraction of visiting Kumarakom is its Bird Sanctuary. This manmade bird sanctuary is spread across 14 acres along the banks of River Vembanad and offers flourishing grounds for native birds like ducks, waterfouls, cuckoo, owl, egret and heron, besides a staggering variety of migratory birds like Siberian crane, parrot, teal, flycatchers present in overwhelming numbers. The best time to catch these birds here is during the months of October and March. Thaneermukkom Bund – The Thanneermukkom Bund was constructed as a salt water barrier to to block the intrusion of salt water in the lowlands of Kumarakom. The construction of this bund or bridge has surely helped the farmers who earn their livelihood through farming on the lowlands. This bund is also a connecting link between two districts of Kottayam and Allapuzha, dividing the lake into brackish water stretch and other half fed with fresh water from the rivers draining inside the lake. By Road - Kumarakom is well connected to Kochi (62.7 km), Thiruvanathapuram (174.1 km) & Madurai (258 km). By Railways - Kottayam is the nearest railway station (16 km) away from Kumarakom. Climate – Based on tropical climate, Kumarakom enjoys pleasant climate from January to April and August to October. Kuttanad – Famous as the rice bowl of Kerala, Kuttanad is famous for its large paddy fields. This region with its lowest altitude in India is also one of the few unique places over the world where farming is extensively carried out below the sea level. Ayamanam – If you have read “The God of Small Things”, then you shouldn’t miss visiting Ayamanam during Kumarakom city tour. The beauty of the setting right from the book comes alive as you walk through the banks of Lake Vembanad and River Meenachil, and experience paradise pickles & preserves in the region. Periyar Wildlife Sanctuary – Periyar Wildlife Sanctuary is surprisingly South India’s most famous wildlife sanctuary known for its wild spotting treks. Spread over 777 sq km, this wildlife hotspot features over 1000 elephants and 46 tigers besides a 26 sq km manmade Periyar lake for supporting ecosystem. Besides these wild attractions, tourists get a chance to witness bison, wild boar, sambar, langurs, lion tailed macaques and gaurs in the wilderness of this natural wild habitat.